باقرپور, امید, حبیبیان, بنفشه, اسکوئی, بهروز. (1397). Three-dimensional Magnetotelluric Modeling of data from Northeast of Gorgan Plain. مجله ژئوفیزیک ایران, (), -. 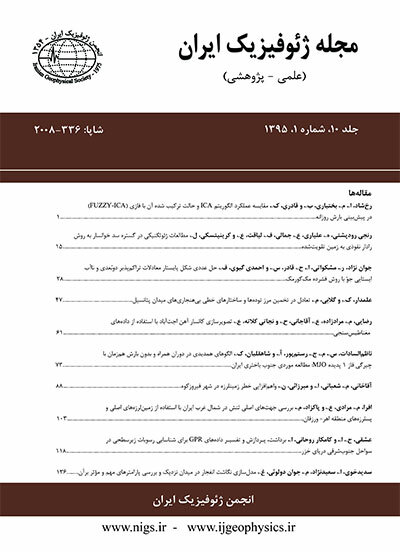 امید باقرپور; بنفشه حبیبیان; بهروز اسکوئی. "Three-dimensional Magnetotelluric Modeling of data from Northeast of Gorgan Plain". مجله ژئوفیزیک ایران, , , 1397, -. باقرپور, امید, حبیبیان, بنفشه, اسکوئی, بهروز. (1397). 'Three-dimensional Magnetotelluric Modeling of data from Northeast of Gorgan Plain', مجله ژئوفیزیک ایران, (), pp. -. باقرپور, امید, حبیبیان, بنفشه, اسکوئی, بهروز. Three-dimensional Magnetotelluric Modeling of data from Northeast of Gorgan Plain. مجله ژئوفیزیک ایران, 1397; (): -. Magnetotelluric measurements have been conducted in the period range of 0.005-128 s along five parallel east-west directed profiles including 85 sites totally in the north-eastern part of Gorgan Plain, Golestan Province, North of Iran; with the aim of exploring iodine. Distortion and dimensionality analysis of data imply the existence of a north-south elongated two-dimensional model with some localized three-dimensional effects-particularly at long periods- that has been mildly affected by non-inductive distortions. Exclusion of a very few data points with large values of distortion angles and rotation based on the selected azimuth of strike, was followed by two-dimensional inversion of joint TE- and TM-mode apparent resistivity and phase data. After some resolution tests to ensure the reliability of the detected features, three-dimensional inversion of real and imaginary parts of full impedance tensor data was accomplished. Despite the reduced resolution of magnetotelluric data in a conductive environment, the elimination of part of the data due to hardware constraints and the lack of an ideal data acquisition pattern, the models showed some definite results. The resulted electrical resistivity models from both two- and three-dimensional inversion resolved highly conductive bodies as our exploration targets-which are expected to be saline aquifers containing iodine- within the generally conductive sediments. There are various examples of the use of the magnetotelluric method in the investigation of groundwater potential and detection of aquifers and their contamination in the literature (Alies & Rodriguez, 2015; Asaue et al., 2012; Falgàs et al., 2005; Mejiʹas et al., 2008; MeliʹI et al., 2011; Pedersen et al., 2005; Steuer et al., 2008). Considering that the study area is located at a proper distance from the Caspian Sea, it has the potential for geological storage of iodine reserves. The groundwater resources in the study area are most likely to contain salts with a high percentage of iodine as a rare mineral. In the previous investigation of the data, a different data-set was used; no strike angle was estimated, and resistivity models derived from one- and two-dimensional inversion of the determinant of the impedance tensor were presented (Oskooi et al, 2014). In this paper, the results of strike estimation and distortion analysis, as well as inversion of joint TE-TM mode data and three-dimensional inversion have been discussed. We estimated the strike and dimensionality of the data based on the phase tensor method (Caldwell et al, 2004). The phase tensor is defined by the ratio of the real and imaginary parts of the impedance tensor, and its prominent feature is that it is not affected by distortion. The skew angle or the tensor’s asymmetry can be used as an indication of dimensionality. The azimuth of strike is determined based on the orientation of tensor’s principal axes. Figure 2 displays a map of phase tensor ellipses for the whole frequency range and the characteristic profile I. The color bar shows the skew angle values. As it can be seen, data show mainly one-dimensional behavior (low values of the skew angle) with some local two- and three-dimensional effects, especially at long periods. The regional magnetotelluric response can be distorted due to the presence of the small-scale near-surface structures. The level of distortion was examined using WAL rotational invariants (Weaver et al, 2000) implemented in WALDIM code (Mart'i et al, 2009). Based on the values of a set of eight rotational invariants-including seven independent and one dependent parameter and considering threshold values for each of them regarding the level of present noise- dimensionality, strike direction and values of shear and twist angles as part of distortion parameters along with their errors are estimated. Figure 5 shows histogram of estimated twist and shear angles for the characteristic profile I. Low values of these two parameters indicate that the data have not been severely affected by distortion.